"Lovely well kept beard on that lady." said Rex wistfully. "Why was she squinting at us like that as we left?" the raccoon riddled breathlessly. "I reckon 'cause she gave us her best evil eye;" said an unusually thoughtful Tex. "Though I can't see what's so evil about it"; he continued, holding up a slimy, glistening orb to the light. "What a strange gift"; squeaked Rex slowly, trying to outdo Tex in the coolness stakes; "I usually prefer shortbread, given the choice." "Surreality is the acme of aesthetics" observed Cut-throat Jake, who immediately embarked on a touching rendition of the Trumpet Hornpipe on his wheezy concertina. "How touching", observed Rex, pawing his newly-acquired gift along the deserted Moldovan 'motorway' as if it were a marble, albeit somewhat grotesque. Gradually, the three heard the rumbling of cartwheels as a ramshackle horse-drawn equipage hoved into view in a gradual way. Mounted precariously upon it was the rusting bodywork of a scrap Trabi 106 that had seen better days - which clearly indicated that the cart was of Roma provenance and on its way to the scrapyard. As Fortune would have it, the local Queen of the Gipsies just happened to be sitting in the driver's seat. Fortunately, she also just happened to be a renowned soothsayer. "Forsooth!" she said to Cut-throat, in broad Queen's English while eyeing up another potential punter. "Wouldst thou likest thine fortune foretold? One is a star with the tea-leaves - although one sayeth it oneself". Rex quickly lost interest in the rolling orb and greedily eyed up the shortbread she was nibbling: Tesco's Best Scottish. "Your dreams may be thine. Cross my palm with £10,000 in silver and thy future will I divine." continued the velvet shawl wearing Queen between nibbles. The air wheezed asthmatically from the battered concertina like a deflating bagpipe as Cut-Throat Jake's jaw dropped. "£10,000! Last time my fortune was told I paid a tenner!" exclaimed Jake; "Told me I would be a rock star, total ripoff." he grumbled. "Giz us some shortbread missus." interjected Rex. Studiously ignoring the impertinent interjection the moth eaten Queen, almost resplendent in ermine and velvet, continued to address Jake. "One is no local slattern costumed in glitter strewn scarves and bangles;" she said imperiously; "One is Esmerelda, Queen of the Gypsies." announced the boil ridden grande dame. "Go on, just a bite." wheedled Rex. "Thou doesn't know how hard it is to uphold one's place in society." The lady explained. "Money is relative you see, it's alright for some fairground bint to ask for a tenner to mend her tent but one has a court to maintain and one must set one's rates accordingly*. Ermine and velvet doesn't pay for itself you know." The Queen continued with an air of reproach. "How about a few crumbs?" begged Rex as he perched on his hind legs to be closer to the object of desire. *basic idea stolen from Terry Pratchet, Shame I can't steal his talent too. To pacify the persistent rodent, Her Majesty relented, and imperiously tossed a few crumbs onto the ground (in the admirable royal tradition of monarchs tossing small change to their poverty-stricken subjects), and the ravenous raccoon gobbled them up with undisguised gleeful gluttony (and gobbling noises). "I'm graciously honoured by your gracious majesty's generosity", the smooth talker grovelled obsequifawningly. "It is One's pleasure", replied HM condescendingly, "One is deeply touched, aren't we?". Mr C.-T. Jake's initial shock at Queen Esmeralda's prognosticative pronouncement, which had caused his concertina to espire, soon melted into a feeling of admiration. The Queen was clearly a woman after his own heart, an equal at the fleecing stakes, a rival to be reckoned with - and overcome. "Of course I only jest, Your Royalty. I don't happen to have the readies on me, but I can give you an IOU, and I'll dig up the requested sum of 10,000 GBP from the island in the Danube delta...er... where I bury... er... stuff for rainy days. I'll send it to your palace in Buzescu by ox-cart within 7 days". He then piously made the sign of the double-cross. The Queen feverishly licked her lips in anticipation. "Done!" she replied, her gold teeth glinting in the sun. She spat on her velvet-gloved hand and proffered it to the scheming ne'er-do-well. Instead of shaking it, as is the Rroma custom, he kissed it, as is the Romanian custom. He got Rex to scratch a makeshift IOU with his paw, on the back of a piece of cardboard torn off an empty Tartan Shortbread box, for he himself was thoroughly illiterate and Tex's illiteracy was near complete, so Hanzel seemed the best bet being merely barely literate. It was witnessed by the 10,000 sunflowers watching from the nearby field. These formalities didn't matter one jot for the Queen, as it happened, was also somewhat literally challenged herself, especially in foreign tongues. She grabbed at the promising promissory note with determined enthusiasm, and her gold rings, necklaces and teeth gleamed dazzlingly in the sun. C-T, fingers crossed behind his back, eagerly awaited the wily beldame's prognosticating. Meanwhile, elsewhere, outside the Artico piramidă (Chișinău's answer to the Louvre pyramide), the only Irish Lollipop, Isabelle, and her Lollipop friend Masha, were celebrating St Dagobert's day in the only way they knew how, by bouncing around excitedly while singing a song about the imminent arrival of Moș Craciun. The two friends jiggled* jollily and sang in perfect pitch and harmony; "Santa Claus is coming to town, Santa Claus is coming to town. Santa Claus is co-oming tooo Towwwn!" "...So he is." Added Isabelle in her Irish brogue and received a most unfriendly look from Masha. "We've talked about ethnic stereotyping before haven't we Isabelle?" asked Masha curtly in her best rhetorical school ma'am tone. "We have, to be sure, to be sure, but a flourish adds something to the ditty, so it does." Isabelle lilted as near to the fashion of an innocent springtime milk maid as a lollipop could lilt. "You're not funny." said Masha sullenly but with the hint of a smile around her eyes. Back on the road, fortunes are about to be told... and perhaps made. *Edited to Jiggled. Was previously Jiggered until I saw it's definition in Oxford dictionaries DOT com. Oh dear, I never knew it meant that! Sorry about the festive interludubrium. 'Anon' turned out longer than expected. Patience is a virtue, and we all have our crosses to bear, so we must look on the bright side of life. So where were we when time stood still? "The tea-leaves must be prepared! The drinks are on One!" "On one what?" queried the querulent rodent, impatiently stamping the ground with his hooves. "She means she's going to be Mother" explained Cut-Throat. "Nu! Mumă's gone to visit her old friend Babă", explained a passing lemming. "Peasants! See that well over yonder. I command you to fetch One a pail of apă". The peasantry bowed in deferential reverence. "With pleasure Your Greatness" said the peasantess, Ionela. "Ouch!" said Ion, t'other one, for in his eagerness to bow, his head hit the hot samovar. Jake, who was a dab hand at surgery, kindly dabbed the injury with vinegar, and wrapped a piece of greasy brown paper around it. "Least said, soonest mended. That be what oi say", he said cryptically. Ionuț and Ionela then went up the hill to fetch the pail of water. Ionuț fell down and grazed his knee, for his head had already been wrapped up, and only the queen had a crown. To cut a long story short, the curious raccoon watched in wonder, as on the hill, a long creaking wooden beam lowered and then rose with a wooden bucket hanging from one end. "How wondrous! ", he noted, "I ain't seen any of them there wondrous, hi-tech contraptions back home on the Texan taïga," he observed wonderfully. "You've not lived!" mocked Her Maj regally. Suddenly, from around the bend came the jingling of bells and the hurried clopping of reindeer hooves. *Technical note - M doesn't stand for motorway for they're as yet undiscovered. 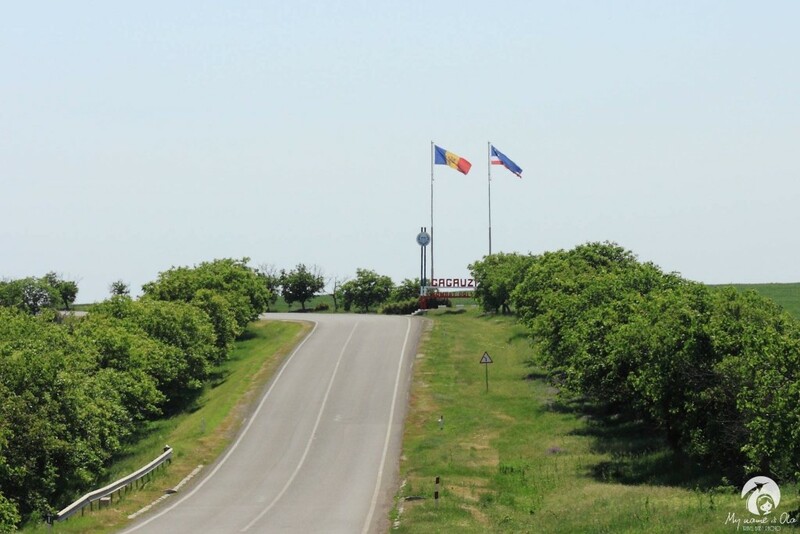 It stands for main roads (drumuri magistrale), and there are six main roads in Moldova: M1-M4, but the M14 (part of the E58, E581 and E583) and M21 (part of the E58 and E581, and which becomes the M13 across the border), kept the old Soviet numbering. Cyrillic signs still show the R roads as P roads. To clarify, the M3 is the continuation of the DN2B from Romania, and a small stretch of the M3 is the E87 European road, the extension to Gagauzia is the M3.1. E roads have thrown a spade into the roadworks, so the M1 is now also part of the E581. A small part of the M2 is the E584. Over 200km long, the M3 is only a dual carriageway for the first 30km, but it is surfaced all the way. R roads are regional roads (drumuri republicane), and L roads are local roads - numbered often with decimal points, but usually unsurfaced. For further obfuscation, there are also several LI roads and an LIII, but no LII's, but for clarity, I won't say more about those. Inspiration has absconded, my muse has moseyed off. I hope to rejoin this story when I have risen above my sloth. To any who would take up this tale, my cap I will gratefully doff. Aww! So you have a pet sloth? How sooo totally cuuute! I've always wanted one of those creatures ever since I got my paws on a book years ago, "A Sloth in the Family" - but why do you want to rise above him/her? Is it so you can scan the surrounding terrain from the top of her/his tree in search of stray muses? I'll take up the tail this evening if nobody else does. (Deferential doffing welcome). I feel a Kriaytiv Urj urging me with a sense of emurgent urgency. My Muzicuța is compulsively compelling me ever creativewards. Last edited by mihaela on Mon Jan 02, 2017 8:29 pm, edited 1 time in total. "...is not an amuzing one..."
andthistoomustpass wrote: "...is not an amuzing one..."
I'll have you know that it is NOT an amuzing sight! You must be aesthetically challenged. So there. My decison is final. Meanwhile, my creative urj had waxed and then waned (as is its wont, although one doesn't one't it two), and has now waxed again to a mildy extreme level. As Santa's careening sleigh skidded on the ice it careered into the Queen's carriage causing the Crown Derby crockery and the simmering silver samovar to fall off and roll wrecklessley down the hill. To cut a long story a little less long, the precious object was saved by dint of noroc, dented but not daunted, but alas! the Crown Dobrogea was smashed into numerous small, smaller and even tinier smithereens. The lemming (who was still passing) said in passing that he had a jar of Gloy glue in his backpack reserved for such contingencies, but the others declined the kind offer, and kindly sent him back packing. By now Mr Claus had given his panting steeds a sack of reindeer moss to nibble at, and had caught up with the throng at the bottom of the hill. "Sorry about that little mishap. Blitzen took the bend too quickly. He moves like lightning when he gets the urj", he garbled in his thick Saami brogue, with its tinge of Karelian lilt. Rex chittered randomly, speechless for once. "Do any of you kind folks know the way to North Lapland. I'm lost and need to rest after finishing my express deliveries for another year. I think I made the wrong turning just outside Ledbury". "'Tis easily done", drawled Tex, a man of few words, as if he'd done it many a time. "Why not hang around here for a bit? We were just about to discover what the future beholds for the year to come", advised the twins in perfect harmony. "It'll cost you, naturally! ", snapped Ez excitedly, "but I can see by your fancy fashion accessories and that top-of-the-range false beard that you're a man of considerable substance". "Ho, ho, ho!" he guffawed, the aroma of expensive vodka on his breath, and his upmarket bling jingling ostentatiously. "I'm not short of a bob or two, if truth be told. You're uncannily perceptive. And I see you're a woman of means too", he added with uncanny perception, eyeing up with shifty eyes her jewel-bedizzened finery, filigree and furbelows (replete with tastefully gold-embossed nomographs) in that specific order. "Then that's decided" chorused Rex and the lingering lemming with an air of finality. "And thus it was", pondered the narrator. Meanwhile back in town, the Lollipops had amassed en masse on the wing of an aircraft and were joyfully singing "Vine, vine anul nou!" while the crowds cheered from below. Back at the farm in Snailbeach, Great Aunt Ada was eagerly reminiscing about 'something' she'd seen in a woodshed long, long ago - while meanwhile yet again, back at the ranch things looked as grim as usual.